This article is sponsored by Easy Weddings. 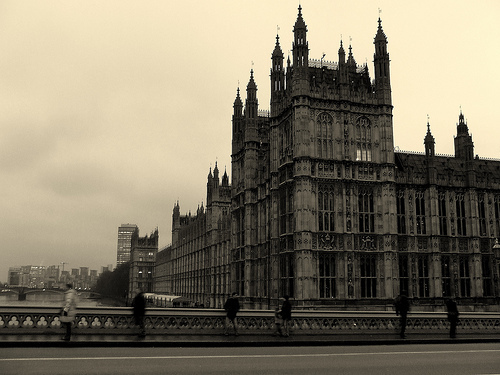 If the Palace of Westminster isn't quite in your budget, check out their collection of wedding venues for more inspiration. Looking to upstage Kate and Wills on your big day? If you have £25,000 to spare and 600 friends and family to invite, you could take your vows beside the Houses of Parliament. The Palace of Westminster is looking to cash in on the trend for lavish venues in the wake of the Royal Wedding by hiring out the historic Westminster Hall to couples to make up for proposed cuts to Parliament's subsidised catering budget. According to a cross-party committee of MPs, the £5.7m annual catering loss at Westminster can be blamed on MPs healthier lifestyles and less formal lunch plans, which are leaving Parliament's four dining halls largely unoccupied. As part of a royal palace, the 11th-century Westminster Hall, which was host to the trials of Charles I and Guy Fawkes, would have to gain approval from Buckingham Palace to give the public access during recess, when the House is not sitting. The MP committee, chaired by Deputy Speaker of the House of Commons Sir Alan Hazlehurst, has also suggested that under new money-spinning proposals, tourists on Houses of Parliament tours could take afternoon tea with MPs on the private Terrace Pavilion. MPs may be forced to share their exclusive facilities with the public, seeing fine dining replaced with coffee shops and take-away sandwich bars. There is also the suggestion that Westminster's traditional catering services will have to be sacrificed completely and outsourced to a private company if the House does not save enough money. MPs are hoping that a surge in tourism following the Royal Wedding will see an increase in visitors to Westminster. “There is a stonking profit to be made,” said Alan Halzehurst. This article is sponsored by Easy Weddings.